With so many new awesome restaurants popping up around Metro Manila, it's safe to declare 2016 as the year of the foodie. There's just no escaping good food if you're constantly online, with news about new restaurants, easy recipes, delicious eats, and mouthwatering foodstagrams littering your social media feeds. The only downside? Near-constant food cravings that just won't let up. Good thing Bonifacio High Street has a host of excellent new and upcoming restaurants to solve the direst of hunger pangs. As a bonus, the food at these spots are both drool-worthy and Instagram-friendly, so you can work on your achieving your #FeedGoals while taking care of your #FoodGoals. Check them out below! After the resounding success of cookie haven Scout's Honor and pastry paradise Le Petit Soufflé, dessert magicians Miko Aspiras and Kristine Lotilla next set their sights on reinventing ice cream. Enter Freezer Burn, a dessert parlor that combines their freshly churned ice cream with fresh-off-the-oven treats. The result: an unlikely combination of hot and cold that surprisingly works. A must-visit for ice cream lovers! Must-tries: Freezer Burn's Best Mint Ice Cream is an excellent way to cool down in Manila's perpetual summer (P150 for one scoop, P180 with two toppings, P190 with three toppings, P350 for a pint). You also shouldn't miss their bestselling Composed Desserts: Try their Ketchup Mayo Fries, which pairs ketchup and mayo ice cream with salt and pepper fries (P295); the BBPPBB, which pairs browned butter pecan ice cream with a peanut butter waffle liege and a banana (P295); and the Junkie, which combines cookies and junk food ice cream with nutella donuts and caramel sauce (P295). Freezer Burn is located at B3, Bonifacio High Street, Bonifacio Global City. With its pastel walls, breezy interiors, and picture-perfect food plating, Sunnies Cafe is total #IGFeedGoals. No surprises here, as it's run by the same fabulous team behind Sunnies Studios. Luckily, the food offerings here taste just as good as they look: comfort food at its picture-perfect best. Sit down with your amigas for their all-day brunch, drop by for their too-pretty-to-eat desserts, or cap off your day with one of their cocktails or milkshakes. Must-tries: Order Sunnies Cafe's Crispy Tacos (P270) for your appetizer, followed by the Pan-seared Miso Salmon (P470) and the Baked Squid Ink Lasagna (P360) for your main course. Cap it off with some dessert: we loved the Sunnies Funfetti (P290) and the Kimye milkshake (P190). Wash it all down with something from their cocktail menu: Try out The Churchill (P195), the Skinny B*tch Sangria (P245), the Elektric Cool Aid (P175), and the Selena Tequila (P245). Sunnies Cafe is located at B3, Bonifacio High Street, Bonifacio Global City. Torch has been a foodie favorite since its inception in 2010, so it was just a matter of time before it opened up a branch in BGC. Southerners can now rest well knowing that they don't have to drive all the way to Quezon City whenever they're craving for Torch's fusion specialties. 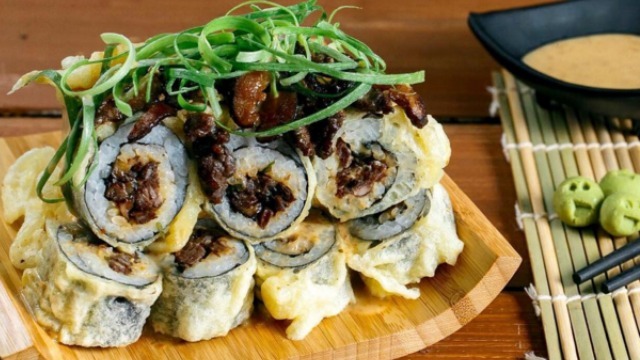 Must-tries: Aside from their famous Salpicao Medallion (P579.95) and Volcano Roll (P374.95), you should also try their Cowboy Roll (P389.95). It's a roll deep-fried in tempura batter stuffed with thinly sliced U.S. Angus Beef filled with shiitake mushrooms, with a serving of sesame sauce on the side. Torch is located at UG C2, Bonifacio High Street Central, Bonifacio Global City. One of the country's best delis has finally set up shop in BGC, making it easier than ever to get your hands on their selection of fine cheese and European sausages. It's always a treat to visit Poco Deli during lunch or dinner, with their wide selection of hearty, meat-powered dishes that'll satisfy rumbling tummies. Wash down your meal with one of their craft beers or fine wine for a perfect finish! Must-tries: Poco Deli's known for their top-grade meats, so go ahead and indulge! 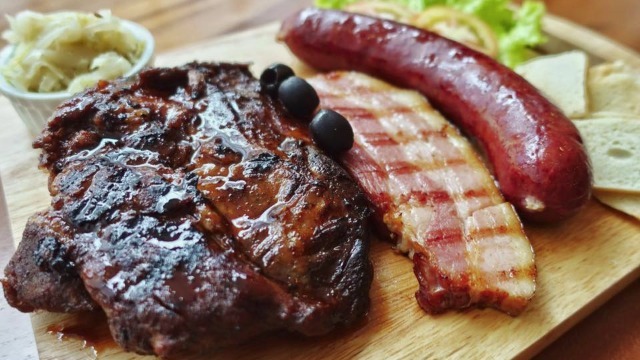 Get the aptly-named The Carnivore (P650), which has a bacon slab, smoked barbecue ribs and a Kielbasa sausage. It's a pretty hefty serving, so make sure you've got someone dining with you (but we'd totally understand if you'd rather finish it all by yourself!). Poco Deli is located at One Parkade, 7th Ave. cor. 28th St., Bonifacio High Street, Bonifacio Global City. In the mood for Filipino food? Kartilya's got you covered. Take your pick from MasterChef Asia Season 1 finalist Lica Ibarra's proudly Pinoy culinary offerings, all made with a unique twist. Don't forget to finish your meal with the heavenly Queso De Bola Bibingka Soufflé, which was Chef Lica's winning MasterChef Asia entry! Must-tries: Kartilya's Kansi (P390) is an unforgettable rendition of the Ilonggo favorite. Think of it as a combination of sinigang and bulalo, with tender corned beef swimming in a sour beef broth seasoned with lemongrass, tomatoes, kamias, annatto oil, and chili. If you prefer something more sinful, go with the bestselling Liempo Queso Fundido (P290), which is delicious proof that melted cheese tastes good with everything, smoky pork slices included. Kartilya is located at Two Parkade, 7th Ave. cor. 30th St., Bonifacio High Street, Bonifacio Global City. If there's one constant in the Pinoy diet, it's definitely rice. But while the humble grain is usually content to play second fiddle to richer viands, ArroZeria pushed it right under the spotlight, making it the star of the show via its standout paella, risotto, and fideua offerings. Pair all those carbs with some of their excellent tapas and sangria for a vibrant Spanish meal! Must-tries: It's a shame to visit ArroZeria without ordering their paella, but they've also got some stellar options if you're not in the mood to load up on carbs or are dining alone. Our picks: the ArroZeria Chorizo Burger (P390), which has a homemade chorizo patty, crispy jamon, porcini mayonnaise and manchego cheese; the Crispy Calamari Roll (P375), squid ink-battered calamari on ciabatta bread; and the Pork Rib Sandwich (P350), caramelized pork ribs on ciabatta bread with a confit of red capsicum and jalapeño. ArroZeria is located at the UG C3, Bonifacio High Street Central, 7th Avenue, Bonifacio Global City. Fowl Bread's menu isn't an extensive one. The highlight is their chicken sandwich, which sounds really boring—until you taste it. The magic's in the filling: Each perfectly golden bun embraces a large piece of chicken and a beautiful, perfectly crispy sheet of chicken skin. Pimp your burger with add-ons like fries, potstickers, wings, and garlic noodles, and your tummy will be all set. Must-tries: Fowl Bread's menu is a pretty straightforward affair. Go straight for their Fried Chicken Sandwich, which you can have a la carte (P245) or paired with garlic fries (P320). You won't regret it. Fowl Bread is located at B3, Bonifacio High Street, Bonifacio Global City. Chef Bruce Ricketts' latest baby, opening soon at Bonifacio High Street, is a far cry from Mecha Uma's haute cuisine. The ambiance isn't as intimidating, and the prices are much cheaper. However, the lower price tags don't correspond to lower quality food: Each bite of every dish, from the O-Gyoza to the Hamachi and Kani Aburi Maki, bursts with the vibrant, unexpected flavors Chef Bruce is known for creating. With Ooma coming to town, it's safe to say that BGC's Japanese food scene will never be the same again. Must-tries: You shouldn't miss the raved-about Scallop and Tuna Aburi Maki (P295), a rice-wrapped combination of torched scallop, tuna, cucumber, nori crumbs, sesame seeds, and scallions drizzled with teriyaki sauce, spicy mayo and kimchi aioli. The Uni Udon, which features fresh uni, shrimp, onions, and fresh mushrooms, also comes highly recommended. Want something more indulgent? Get the Hanger Steak (P498), a tender steak served with sautéed mushrooms, sweet potato mash, and crispy potato with a drizzle of white truffle oil, herb oil, and ponzu butter. Ooma will be located at LG C3, Bonifacio High Street, Bonifacio Global City. When we're craving for something hot to warm the tummy, Din Tai Fung's world-ramous Xiao Long Bao always comes to mind. These tiny soup dumplings are so delicious, we'd willingly brave the EDSA traffic just to eat them at Din Tai Fung's Ortigas branch, which is usually bedevilled with long lines. So imagine our sheer delight upon hearing that we can soon get our Xiao Long Bao fix in BGC. Get in our tummies, dumplings! Must-tries: The xiao long bao, of course! Their Pork Xiao Long Bao (P160/5 pcs, P315/10 pcs) is a great choice for first-timers—one bite and you'll understand why this restaurant got a Michelin star. Cap off your meal with their unexpected sweet treats: try the Golden Lava Salted Egg Yolk Bun (P85) first, followed by their sinfully heavenly Chocolate Lava Xiao Long Bao (P115/3 pcs). Din Tai Fung will be located at C1, Bonifacio High Street Central, Bonifacio Global City. A stop at the Pablo store is a must-do in Japan. Eating their world-famous cheese tart is a foodgasmic experience, with the tasty crust blending perfectly with the velvety cheese oozing from within. 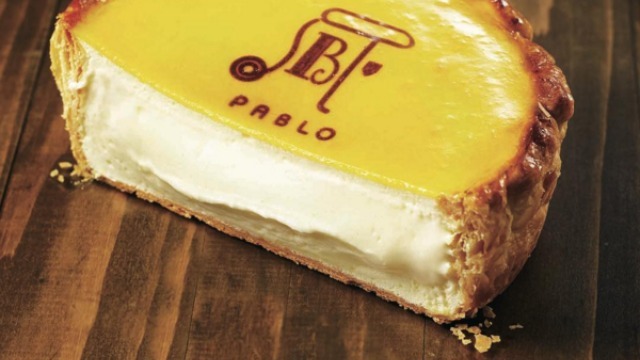 With Pablo opening its second branch soon at Bonifacio High Street, we can now have our fill of their fresh cheese tarts and other cheesy delicacies any time we crave for it. No need to fly all the way to Japan! Must-tries: There are a few varieties of freshly baked cheese tarts available at Pablo, but the ridiculously creamy Classic Cheese Tart (P599) is a fail-safe option. You can also take your pick from its rich line of pastries, including cheese puddings, cookies, drinks, and soft-served ice cream. Pablo will be located at B2, Bonifacio High Street, Bonifacio Global City.